By nature, a cocktail ring makes a statement due to its size, but this Pink Topaz and Diamond Cocktail Ring in 14K White Gold takes making a statement a step further by showcasing a unique gemstone that's impossible to ignore. This striking style accents a daring pink topaz with just over a third carat of diamonds, creating a look that will never fade into the background. The brilliant semiprecious gemstone that stars in this statement piece is a vibrant oval-shaped pink topaz. This stone has a matchless bright pink hue that seems to take the essence of fairy tales and girlhood fantasies and render it grown up and glamorous without losing its sense of fun along the way. While a pink topaz of any size is eye-catching, this gem's stature gives it an extra boost of boldness. At 10mm high and 8mm wide, this is a seriously striking gem. 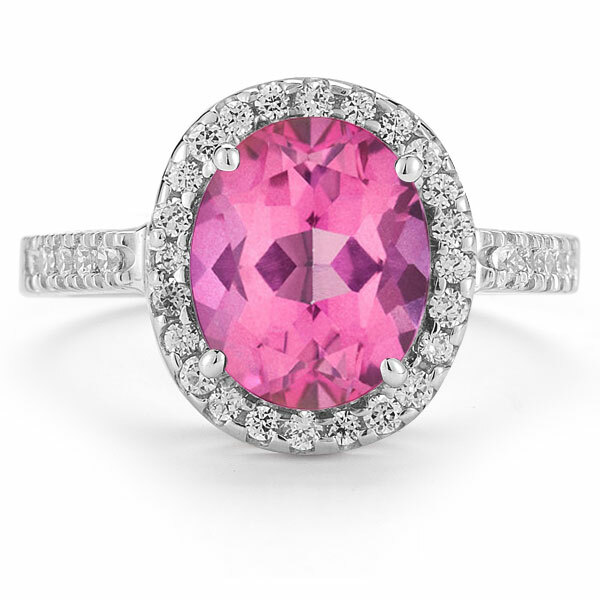 Two dozen petite round diamonds form a frame around this pink topaz, contrasting its vivid hue with colorless dazzle. On either side, five additional small diamonds glitter as they peer outward from the slender yet substantial band. Crafted from gleaming 14K white gold, this setting provides a cool, shining backdrop for this show-stopping style. 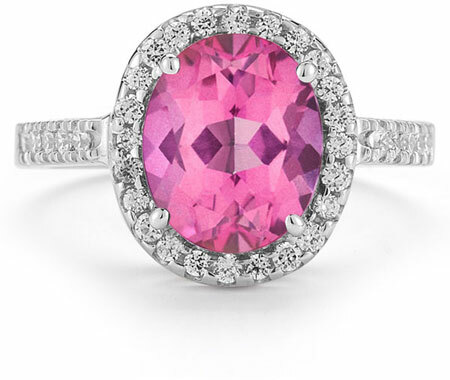 We guarantee our Pink Topaz and Diamond Cocktail Ring in 14K White Gold to be high quality, authentic jewelry, as described above.